Here we are back at the Severn Valley Railway. 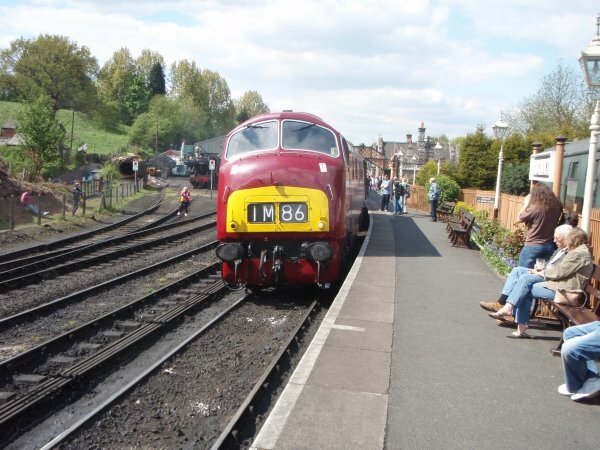 This Sunday they were holding a 1960s theme day - so here is a 1960s diesel hydraulic locomotive. The "Warship" class, for those of a train spotting persuasion. The sunshine also bought a few old faces out. I stopped for dinner at the cafe, as per normal, and the first person I bumped into was a chap I hadn't seen for about a year, the next chap I met was a fellow who I hadn't seen for about five or six years. Just to top it all, the next one I met was a fellow I had not seen for over twenty years.